I, along with my mother, recently had the opportunity happened to pay you a visit for some work. 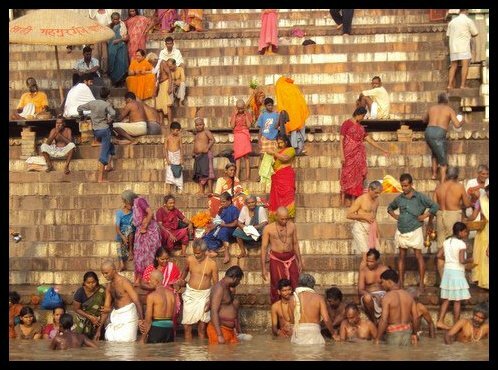 While the world might rave about how you are the oldest city in the world with amazing ghats, river Ganges- the sacrosanct to Hinduism, your food and filth, to me what stood out were the people. Who stared. At you.EVERYWHERE. While it can’t be said enough about the “Classic Indian Smile-less Stare”, but the blokes of Varanasi give you something else in terms of a look, altogether. Mine was a two-days-trip, with the intention of having my first rendezvous with you. Even before I could set my foot on the so-called-holy land of yours, I had a new lesson in staring, in the form of fellow-passengers, in my train compartment. There are other religious cities in the country, but this one takes the cake in leching. We boarded the train from Lucknow. The compartment had 6 other people from various walks of life. There was another lady (a school principal) apart from me and my mother. A robust conversation about how each one was either a “thakur”, a “bhumihar” or a “brahmin” made us wonder if we had booked our seats in the Vidhaan Sabha. A guy, in his late 30s, apparently married, chose my face and body to be the resting-point for his sight. What I mistook for an idle gaze that would last for a couple of minutes or so, lasted for, well over an hour. I was very, very uncomfortable by then, but thought that it is too pre-mature to confront him. What appalled me was the fact that, I was accompanied by my mother, who was acting every bit like the protective parent (something that she doesn’t do often). But this wasn”t enough to ward off anyone. So back to this gentleman,who it turned out, proclaimed “My eyes, my gaze and my discretion” on being questioned by me a bit later. I think, that was the last time he got to speak anything in that 6 hours journey. My mother gave him a piece of mind which, I am sure, would be very difficult for him to forget. Ever. Post-this, the men-folk of the compartment deemed it necessary to discuss how the Indian culture has got ‘corrupt’, with women not following the guidelines of the “Manu-smriti”. All of them unanimously agreed that the women need to “learn to behave like the earlier era.” Of them, how many were around in the era of Manu and sage Bhrigu, I have no idea. Why am I lamenting the bit to you, you ask dear Varanasi? Read on. Cut to the city, to you. I was already peeved with the train experience, with people in general and with my mother for crowding my way protectively as I tried to navigate myself without tripping over and falling flat on my face. It was too much of a task. I suddenly no longer want to meet you. I wanted to take the next train back home. But sadly, the matters at hand were important. So, we jostled our way out of the flood of people at the railway station and reached the autorickshaw stand. Now, how difficult can it be for a tourist to hire an autorickshaw? We asked a few chaps standing idle, if they would go to a place close to Godwalia. The one we asked, stared at our face without replying. We repeated our question. This time, at a notch higher than the previous one, almost with a mild irritation. He, while chewing upon your famed paan, looked away without replying. My mother, who is slightly more accustomed to your ways dear Varanasi, mumbled “he won’t go”, and moved on to the next one. And then the next one. And then a few more. Till we were out of the railway station- premises, on to the main road. There were bunches of idle men-folk standing here and there. Doing what? You guessed it right! 😀 Gawking at people. People seemed to have all the time on the planet here. No, it is NOT a fleeting glance to take note of your being. It is that all-pervading, intrusive with authority, stripping-you-bare, rude stare that one has to deal with. If by now, you are trying to draw a mental image of my being, so that it becomes easier for you to deduce why I “deserved” this, let me help you. I am no hot babe from a metro-city. I am a small town girl. And thanks to my mother’s instructions, I dressed up la-Maneka-Gandhi, and wore suits that resembled tents. And hoped to feel cocooned. And no, this intrusion cannot be shrugged off the mind and being. Over the next two days, I realised that the city with the oldest culture in this world seems to have its own preamble when it came to women. They would look at you, stare at you, leer at you, fix their gaze at you, mindlessly. Or, plain and simple, gape and gawk at you. ALL THE TIME. They had a right to it, or so they thought. I genuinely tried chatting up my auto-wala to figure out the thought behind gaping at ladies. In reply, the poor chap blanked out and blinked at me. Not his fault. His eyes told me that it never occurred to him that it could be wrong. And THAT dear Varanasi, is the scary part. I tried figuring out by digging deeper. Chatted a few more people, including the manager of the hotel we stayed at. This time I was luckier. This guy understood what I was talking about, albeit only half of it. He wanted to know that people in Varanasi stared at tourist, as opposed to what? How do people in other cities look at tourists? And this thought wasn’t the one that only men-folk wondered about. I mumbled something while fixing my dupatta like a shawl, at a saree shop. A fellow-shopper heard me. She shrugged, saying that it is normal “world-over”. Scary. You have painted a very wrong picture of one half the population to the other half. Lucknow, Mumbai, Ludhiana, Shimla, Manali, hell! Spiti, do not have THIS level of uncouth men. Trust me on this. By the end of the second day, as the train wheeled out of the station, I felt a huge block of load lift from my chest. A tight, insecure heaviness loosened a bit. I had not planned my first meeting with you to be tinged with negativity, but trust me, nobody prepared me for this. Everyone talked about your ghaats, tamaatar kee chaat, paan, aartis and sarees. Why do they not warn enough? Would you please “look into” the matter? sad case… the cliche’ that ‘we worship idols of women but don’e respect them in real life’ is so very true… especially since women stare too! and what’s more irritating is that women take it to be ‘normal or ‘chalta hai’ 🙁 men will learn only when we teach them a lesson! I agree that strange paradoxes exist in the name of cultural lattice in any given society on this planet. While a lot of time you can counter-act to a given situation, but that is not the permanent solution. A stronger answer to the problem has to come in their character-building years by sensitizing them towards the impact of their actions on their surroundings. Phew! thats a lot of words! I wish it was easy to bring about this kind of change, but sadly it ain’t. I feel you girl! I was there in Feb this year, I feel you! Totally awestruck at their capacity to go on staring endlessly despite you giving them you-know-I-could-punch-you-in-the-face-looks! It doesn’t matter to them. You can give them any look you want. I hope things change soon.